Round 6 of the Scottish Cyclocross Series headed to a new venue at Inverkeithing High School on the Fife Riviera for The Stephen Lyle Memorial race. And whilst riders and spectators were treated to blue skies and sunshine on race day, the heavy rain in the week leading up to the race combined with a mainly grassy parcours, made for a super tough and muddy course. The ‘euro-esque’ course laid out by promoting club Sandy Wallace Cycles included lots of wide, heavy going grassy sections, some dastardly off camber turns that had riders struggling to stay upright, three sets of steps to run up each lap and some faster rolling concrete paths for a brief recovery. It was a true test of bike handling skills, horse power, grit and determination. 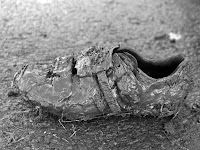 Luck would also play a big part though with several riders suffering race ending mud induced mechanicals. The Youth riders were first up for 30 mins plus 1 lap of racing. Looking super strong and comfortable in the slippy conditions, Ryan Fenwick took the win, ahead of series leader Scott Lindsay in 2nd and Ross Wilcox in 3rd. 113 riders lined up for the Open race and 55 mins plus 1 lap of racing over a course nicely cut up by the Youth riders. Davie Lines and Iain Nimmo were quickest away grabbing the holeshot into a tricky downhill left hand turn, one foot out moto style! Towards the end of Lap 1 a lone rider was first into view – junior Kenta Gallagher tapping out a ferocious pace with a 5 sec advantage over Craig Hardie, then Davie Lines, Bruce McCleary, Iain Nimmo, Paul Newnham and road pro Ross Creber. By the end of Lap 4, Gallagher, looking smooth, powerful and at ease in the slippy conditions had stretched his lead to around 40 secs from Hardie chasing hard alone in 2nd, with Lines and McCleary together a further 20 secs back, themselves just 10 secs ahead of Nimmo. Next lap disaster struck for Hardie with his mud clogged rear mech giving up the ghost, allowing McCleary, Lines and Nimmo to move up. These three continued to battle it out at a high pace and by Lap 8 the gap to Gallagher was down to 30 secs, with Hardie fighting on with just one, jumpy gear in 5th spot around a minute further back. A lap later and Nimmo had managed to drop his chase companions and close the gap on Gallagher to just 15 secs. Still out front, disaster then struck for Gallagher on Lap 10 - a broken rear mech ending a great ride and his race. Nimmo now in the lead powered on, stretching the gap to the chasers over the remaining 2 laps to take the win in fine style. Bravo! Behind, McCleary and Lines remained locked together, neither giving the other more than a few bikes lengths. Rounding the final corner, McCleary led out the sprint with a slight advantage which he held to the line to take a well earned 2nd place from Lines in 3rd. 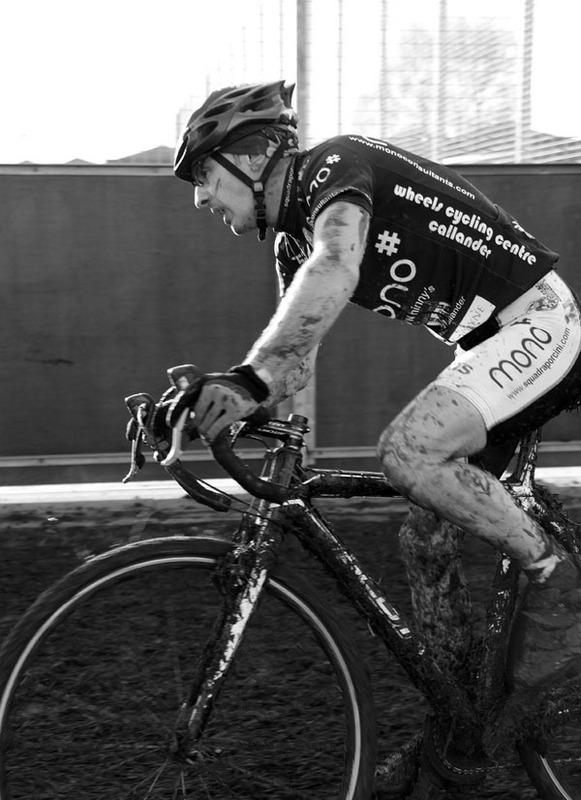 After a race long battle, Ross Creber, 2008 Scottish CX Champ, managed to get the better of Paul Newnham to take 4th place. Craig Hardie’s bike finally packed in with 2 to go, ending his race and denying him another top finish. In the Women’s race, Ruth Fraser-Moodie returned to winning ways after missing the last round, leading the race from start to finish. Behind, Anne Murray rode a fine race to take 2nd spot on the podium ahead of Anne Ewing in 3rd. Lewis Kirkwood measured his efforts in the tough conditions perfectly to come from behind to take the win in the Junior race ahead of Finlay Young in 2nd and Andrew Leith in 3rd. Iain Nimmo’s overall win also netted him the win in the Vets race. 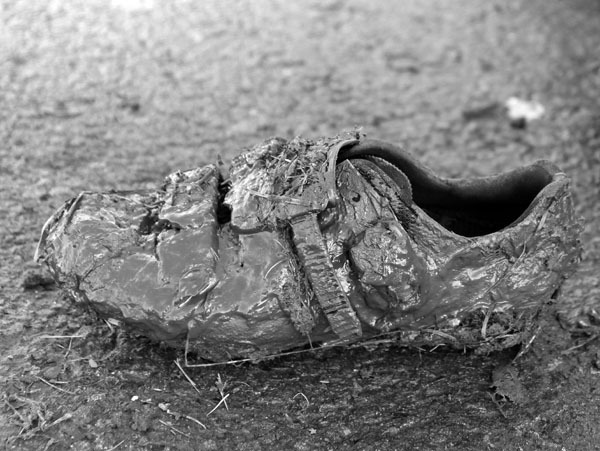 The mud was also a real challenge in the Kids' race, the last race of the day. The adult figure of 8 course was reduced to just one large loop of the playing fields, and the direction reversed to clockwise. In all other aspects the course was exactly the same - long stretches of glue-like mud, a tight slippery corner on the steep bank around the floodlight post for the all-weather pitch, and a steep hill at the far corner. As always at Sandy Wallace's event, the Kids race was split up between U12, U10, U8 and girls & boys - with silver trophies for categories (making it a very popular date in the diary). The race start was staggered, with the scratch riders gridded in the lead U12 group to go at the first starting gun, then the U10 riders in a group for the second gun, and the U8s safely in the rear for the third gun - but all Tee'ed up for a 15 minute race likely to be 4-5 laps long. From the gun the leaders challenged hard to reach the first tight bends before any traffic problems, with Jamie Willoughby (Drumlanrig) sprinting for clear air from Calum Grant (Peebles CC) and holding the lead for a lap and half before the mud and the lurgy had him fading fast. Grant was then chased by Emma Borthwick (Edinburgh RC), who seemed to have the height and bike to defeat the mud, while Joe Nally (Carnegie Cyclones) and Erika Allen (Wallace Warriers) also took up the challenge as Willoughby stopped briefly. From further back in the field and held up in early traffic at the floodlight post corner, Calum Shackley (Glasgow Riderz) was making steady progress, looking for a tactical late attack. On the run to the line Grant crossed first, 25 m ahead of Borthwick who did not notice the fast finishing Shackley who, just as in his last 3 races snatched 2nd place in the very last yards on his lightest of bikes. The U12 finishing order for Boys was - Calum Grant, Calum Shackley, Joe Nally and Jamie Willoughby, with the girls led in by Emma Borthwick and Erika Allen. While the "Calums" took the first two places in the U12, it was the "Camerons" in the U10 - Cameron Mellis (Carnegie Cyclones) rode what appeared to be a well paced race throughout, looking like he would win yet another U10 group, but had failed to notice Cameron Mason staying just 20 yards ahead of him. 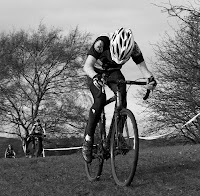 This was Mason's first Scottish Cyclocross race after a good season at SXC (Scottish XC MTB Series), and will be the one for Mellis to now watch out for! At the line Mason won, Mellis second, with Joshua Graham (Peebles CC) taking third. Rhona Callandar led in the U10 girls. Finton Price had his first win, delighted to take the trophy for the U8s, while Rhona Samphier was the quickest U8 girl. As well as excellent changing and parking facilities, Inverkeithing High School also has a great wee cafe that made the perfect venue for post race chat and prize giving. In addition to fine trophies and cash prizes for the podium positions, Sandy Wallace Cycles, Crank Brothers and Clif Bar also kindly provided product prizes. 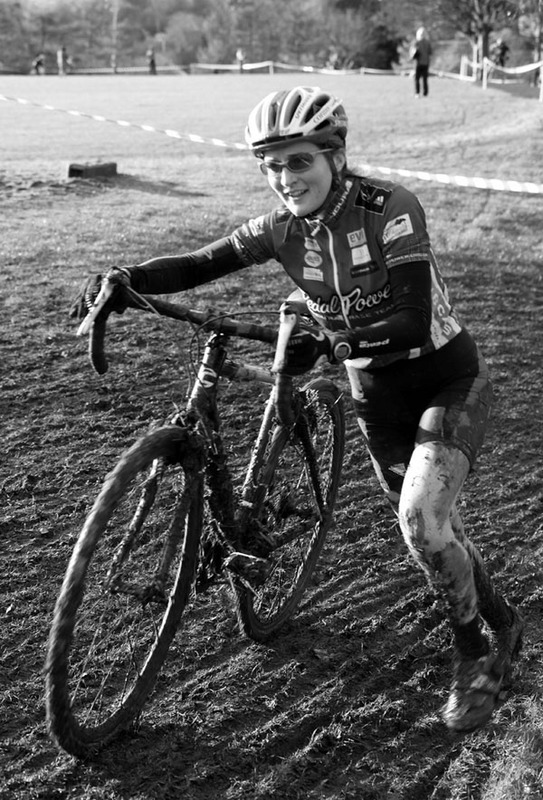 Trina Ritchie and others dodged the flying mud and riders to capture lots of great images from the race, which are available in the Scottish Cyclocross Flickr Group for free! 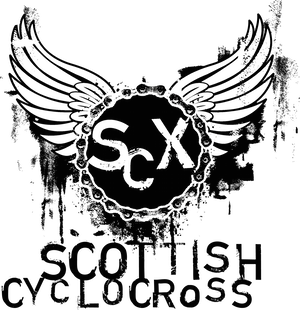 Venue for the Scottish Cyclocross Champs in 2008, Caird Park in Dundee offers up a brilliant cyclocross course – fast and flowing with a healthy mix of quick rolling hard packed path, cheeky run ups, tricky descents, tough grassy climbs and even a burn crossing! Organised by Discovery Juniors CC, the race is set to be a cracker, especially with the Series Standings hotting up and just 4 rounds to go. It’ll also be a great chance for the big guns to hone their form ahead of the Scottish Cyclocross Champs at Glenrothes a week later.